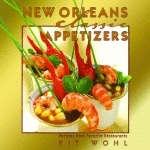 Based on presentations of Meanwhile, Back at Café Du Monde . . ., these foodie monologues invoke your own special comfort foods, recalling tasty memories of life, love, family, and friends to warm your heart, feed your soul, and make you pause to savor the sweetness of life! Accompanied by candid photographs of the many people involved, from speakers to audience members, this book will be a treasure trove of delightful and delicious memories for all. 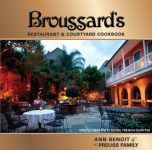 Karen Benrud, a member of the Café Du Monde family of New Orleans, provides the foreword that celebrates the 150th anniversary of the landmark café and its history. 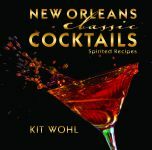 The editor has designated a portion of the book’s proceeds to be donated to Liberty’s Kitchen, a nonprofit organization based in New Orleans. Peggy Sweeney-McDonald is president of Superstar Events-LA and the creator/producer of Meanwhile, Back at Café Du Monde. 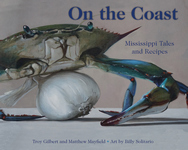 Sweeney-McDonald and her husband reside in Los Angeles, California,and are frequently to be found in her home state of Louisiana. Troy Kleinpeter is a photographer and partner at Kleinpeter Photography, one of the premiere photography studios in the Baton Rouge area. He and his family live in Prairieville, Louisiana. Today I had opportunity to peruse a divine book. 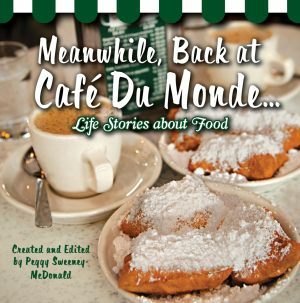 If you are a fan of the New Orleans lifestyle and/or love Louisiana food, then you will love Peggy Sweeney McDonaldâ€™s 'Meanwhile Back at Cafeâ€™ Du Monde: Life Stories about Food. exemplifies food as comfort and an escape!